An important question in the evolution of language is what caused animal calls to diversify and to encode different information. 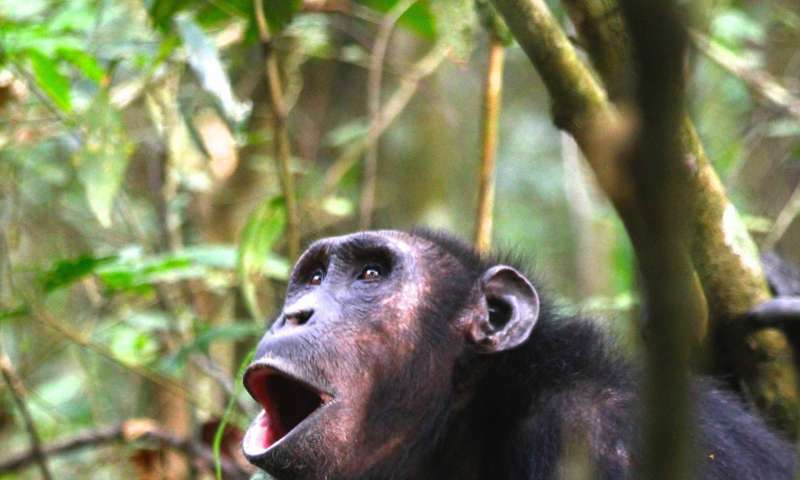 A team of scientists led by Catherine Crockford of the Max Planck Institute for Evolutionary Anthropology found that chimpanzees use the quiet 'hoo' call in three different behavioural contexts—alert, travel and rest. The need to stay together in low visibility habitat may have facilitated the evolution of call subtypes. In order to maintain cohesion, chimpanzee receivers must respond differently to signallers in each context: in rest contexts, receivers must stay in the vicinity of signallers, in travel contexts, receivers must approach signallers, and in alert contexts, receivers must approach signallers slowly. "Chimpanzees benefit from cooperating with bond partners, and are thus particularly likely to gain from staying close to cooperation partners", says Crockford. "However, chimpanzees live in low visibility habitat, such that even when separated by short distances visual signals or non-specific vocal signals are likely to be unreliable in maintaining cohesion. Thus, encoding contextual information in quiet 'hoos' may facilitate cohesion—and therefore cooperation."